Just over a decade ago, I used the California Roll as a means to dip my toes into the sushi waters before diving head first into the good stuff — like ikura and toro. These days, I take a hard pass when it comes to this Americanized rendition of sushi — one that chefs from L.A. and Vancouver dispute over for credit. But there’s no denying that the flavor profile is enticing and refreshing, and it’s one that I like to appreciate in its own way. Away from the sushi menu. 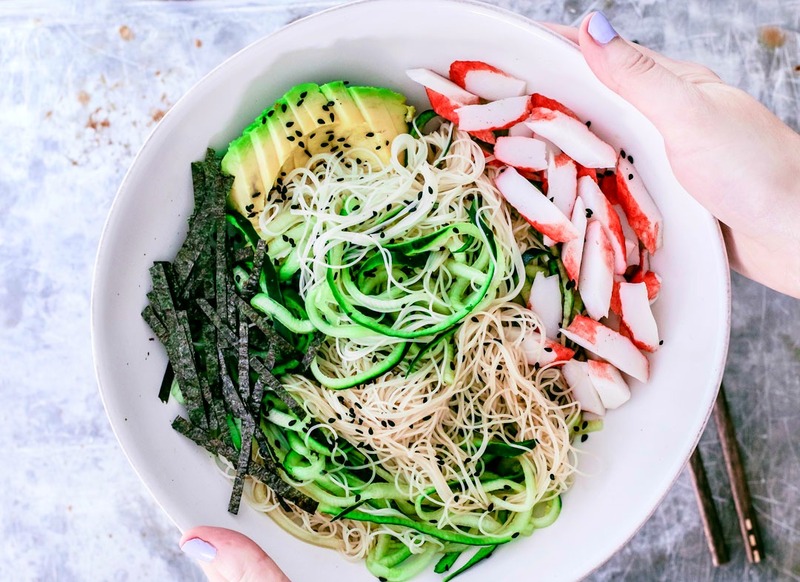 When you bring crisp spiralized cucumber to a bowl with chilled vermicelli noodles, creamy avocado, nori strips, and imitation crab, you end up with a refreshing noodle salad that is summer lunch perfection. Don’t let the word “imitation” irk you. In a quality crab dish, you obviously want to bypass the fake stuff — but in a California Roll, the phony stuff is the right stuff. Plus, imitation crab is still a product of fish; it’s a concoction of fish paste, also known as surimi, and about half of the surimi produced is from Alaskan Pollock. The other ingredients added to the mix vary from Pollock to hake, sardines, mackerel, barracuda, and cod to name a few. Because of the wide variety of possibilities, it’s difficult to pinpoint sustainability and the practcies of the fisheries involved. As usual, the best advice is to read labels, pay attention to the ingredients, and use Seafood Watch or SeaChoice (Canada) for recommendations. Did you make this recipe? Snap a pic and tag me on Instagram: @Killing__Thyme /#killingthyme. For more delish eats, follow me on INSTAGRAM + PINTEREST. This noodle bowl tosses vermicelli with all of the refreshing elements of a California Roll, making it a perfect lunch or light dinner option. 1 TBSP toasted sesame seeds toasting creates a nuttier flavor, but if you don't have time to toast them, you can skip the toasting. 2 TBSP low-sodium soy sauce I always use Kikkoman. In a small bowl, whisk all ingredients from the soy sauce to sesame oil together until well blended. Add a wee bit of wasabi, mix, and taste. Adjust to your liking, but remember that it's always best to add less and add more if needed. Heat a small pan over medium-low heat. Add the sesame seeds to the pan and, stirring frequently, toast until lightly golden if they're white. If you're using black sesame seeds, go by smell. Once the seeds are aromatic, remove from heat. This should only take about 3-4 minutes, so keep a close eye on them. Spiralize your cucumber and put it in a medium-sized bowl. Cook your noodles as per the package instructions. Vermicelli noodles usually only take about 2 minutes to cook, so keep a close eye on them. When done, drain them and rinse them under cold water to cool them down. Shake off any excess water, and add to the bowl with the cucumber. Drizzle the dressing into the bowl and toss the noodles and cucumbers to coat. Taste, and if you feel you need more, simply splash a bit of extra soy sauce in there. Add the crab, avocado, nori, and toasted sesame seeds to the bowl. Gently toss to mix. One of my friends back in 2010 was floored I had never had sushi before. So she ordered me a California roll (and a teriyaki chicken roll, HA) and told me to eat. Well, that is how I fell in love with imitation crab meat that in turn turned me on to King Crab. I am still a bit... iffy with a lot of seafood but I credit imitation crab for at least introducing me to real crab and then salmon. Not sure I'll ever enjoy scallops, but it is a start! This bowl is a beauty and perfect for a summer dinner! Thanks for sharing, Dana! Wow I had no idea about the imitation crab, because I was a little intimidated when I saw that! This looks super easy and tasty, I will definitely try when I'm back from Turkey! You know what? I do like imitation crab! It actually makes a great little snack that's light! This noodle bowl looks SO good! I could definitely go for this right now! That dressing sounds deadly good too :) !! I LUV LUV california rolls and this recipe totally caught my eye on Pinterest yesterday! Thanks for the great info on imitation crab - I assumed it was purely pollock.